Bounced a little, back up to $285. Don't know what's going on but it hasn't been this low in a while. $279 and falling. No news I can find. Maybe somebody called it a "currency". So bitcoin lost nearly 3/4 of its value in 2014 and the Russian Rouble didn't. What's so discussion-worthy about that? If the articles hadn't called bitcoin a currency there would be nothing to comment on. Other than "gee, i wonder if all the people who bought in at $1,000 are feeling good now", maybe. Oh, and whether the people who were touting it are yet ready to admit that maybe Bitcoin is pretty much exactly what we've said it is all along -- a speculators' commodity that is far too volatile and with far too few upsides to ever be useful as a currency. Of course, I never expected that drawing attention to the currency aspect would result in all this hoo ha but - there you go. You're the one creating all the hoo-ha by refusing to just read the words that people say, and instead listening to the words in your head. This discussion is painfully simple for the rest of us; sorry it seems to be hard for you. The article is logically consistant, at least for anyone who believe bitcoin qualifies as a currency. You and Jhunter accepting the article and its conclusion while simultaneously rejecting the premise is illogical. It's logic 101 and I'm sorry if you don't understand but I'm not wasting anymore time on this portion of the discussion. You are incorrect. Here, let me break it down for you as logic 101. Me: Oh, look, an article saying q. Not surprised. psion: Ha! because article, therefore p! You admitted p! p! please p? Us: Nope. We still say !p && q. ...demonstrating that you don't actually understand logic yourself. Did you ever actually take a class in it? Mine was in 11th grade, but that's not so long ago that I can't still remember the basic principles. So tell me, what about the article changes if you replace the word "currency" with the word "commodity" everywhere that it's used to reference Bitcoin? Last edited by remirol; 4th January 2015 at 09:36 AM. Nominated! (And I run TLA so I suspect this has a good chance of getting in the finals poll). Other than "gee, i wonder if all the people who bought in at $1,000 are feeling good now", maybe. Uh Oh! It looks like yet another epitaph. You're I'm the one creating all the hoo-ha by refusing to just read the words that people say, and instead listening to the words in your my head. This discussion is painfully simple for the rest of us you; sorry it seems to be is hard for you me. And you accuse me of listening to the words in my head? The logical "AND" requires both statements to be true so neither line in your quote can be true since q says nothing about the truth value of p.
Had you used a logical "OR" then both your lines would be true. Last edited by psionl0; 4th January 2015 at 10:43 AM. Do not change quoted posts without making it clear what you have done. remirol did not say the words you have attributed to him. Be more careful in future. Last edited by zooterkin; 5th January 2015 at 07:32 AM. I'm just requoting my prediction from long ago, which is that the people who were buying in at $1k were fools. Turns out I was right. Big surprise there. means that both are true at the same time, since that would require that p == !p, which is obviously never true. Seriously. Read the words on the screen. Respond only to those. People have been telling you this for several years now. You can do it; I have faith in you, if you put in the effort. Another comprehension/logic fail. What do you think "&&" means? !p && q == TRUE means that both the statements !p and q are true (or p is false AND q is true). Neither line can be inferred if q is true. "It's just English. Try it sometime." Last edited by psionl0; 4th January 2015 at 12:01 PM. Both remain valid possibilities, as the truth of p is unrelated to the truth of q. Which is what the post said in the first place -- you just would rather play silly buggers than admit anything at all. Of course, if you had just read the original post in the first place rather than conjuring up feverish slashfic in your mind according to the rules of some immature game where you ignore what people actually say in favor of claiming "NO NO YOU SAID THIS I KNOW IT", you wouldn't have this problem. It isn't a rational approach to discussion to assume that a person who has held opinion A for a long time has suddenly ceased to hold opinion A simply because he agrees with another person on a tangentially related matter, even if that other person happens to hold opinion B. It's even less rational to follow him around a thread repeating such rubbish when that person has directly stated "No, I still have opinion A." You aren't a mind reader, and pretending you are in this manner is childish. Last edited by remirol; 4th January 2015 at 02:31 PM. I was going to buy a coin (or wallet, or whatever) at $350 just for novelty's sake (and on the extreme off-chance Bitcoins would increase ten-fold). You can get one for $265 now. Something tells me that if you wait, you'll be able to get it even cheaper than that. What are those guys mining bitcoins going to do with all their computer equipment? Use it to heat their homes. The people who bought in at $1,000 last year are probably feeling pretty crappy about it, but the people who bought in at $20 the year before (and didn't sell) are probably feeling pretty relaxed. Bubbles tend to burst sooner or later. Last edited by Brian-M; 4th January 2015 at 06:52 PM. Yep. The point of the remark (and the prediction) is that there were an awful lot of people in this thread who didn't think it was a bubble. But I bet you're sad you didn't buy a bunch of them at 2$ and sold them at 1000. Both remain valid possibilities, as the truth of p is unrelated to the truth of q. The statements p &&q == TRUE and !p && q == TRUE may be valid possibilities but your conditional statements if q, then .... are FALSE for the reason you gave. if q, then q == TRUE. You know about as much about logic as you know about what I have posted. I have never questioned that bitcoin prices have fallen. I have only said that calling bitcoin a currency was ironic (and ironic doesn't mean anything other than ironic). If you would just acknowledge this irony instead of "playing silly buggers" you could end this exchange and stop making yourself look foolish. 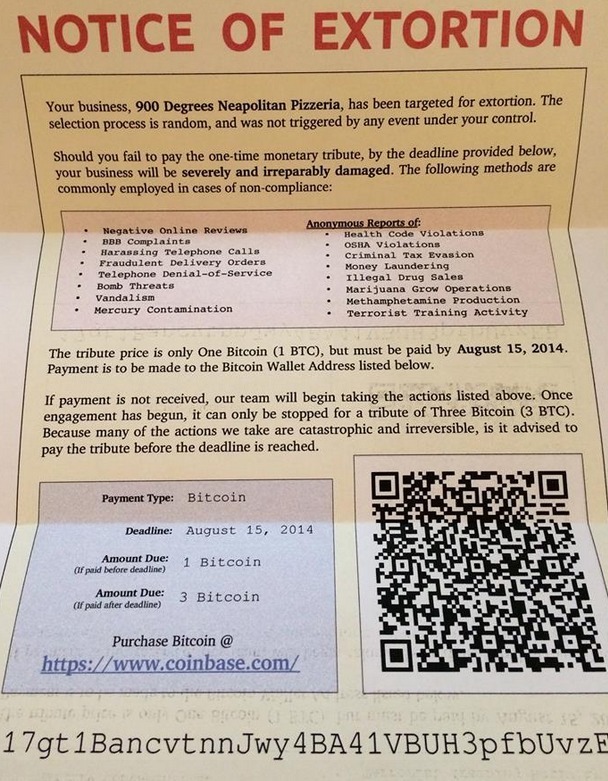 The bet is that Coinbase.com will be hacked (and bitcoins stolen) somewhere between September 2014 and 1 January 2015. The breech must be significant enough to be covered by major media outlets. If you agree to those terms, I'll take that bet. Since any breach would probably make the news, I'll agree. I'll sport the avatar of your choice for a week should that not happen. Very well then. A bet's a bet, after all. And another exchange is in trouble. Just because a tool is used for evil, it does not make the tool itself evil. So this is not intended to say, "Bitcoin is bad because of this." It's just that this seems the right place to show it. So you are now defending the swiss banking industry? Dodging taxes was the entire point of that as well. Indeed. Part of the allure of the much-ballyhooed "anonymity" is the ability to evade taxes; however, as the Silk Road case has demonstrated, BTC is not nearly as anonymous as advertised. Pfft. Coming from a guy with an "I love Bitcoin" avatar ! “That which can be asserted without evidence, can be dismissed without evidence.” – Christopher Hitchens. A gentleman always honors his obligations. Never let it be said that I am not a gentleman. There isn't a "premise". BTC was compared to currencies by the author of the article. I disagree with the author that BTC is a currency, at least in any useful sense, but that in no way invalidates the author's conclusion that BTC performed worse than any currency on earth last year because that conclusion is factual. I can't explain it any more clearly than that. Seems pretty clear to me. They just want debate points for this nitpick about the article calling it a currency. It's clear enough to you, and to me, but apparently not to the target audience. I don't see what my post has to do with dodging taxes. You have to look at the image to see what my text was referring to. Oh, the bet was specific to coinbase.com? I think that catsmate posted about that upthread. Another example of just how safe and secure Bitcoin exchanges are (that is to say, not very). Jeez! This has been going on for nearly 2 pages now. Is it really a crime to observe that the articles called bitcoin a currency? Another example of just how safe and secure Bitcoin exchanges are (that is to say, not very). Nice to see you distinguish between bitcoin and bitcoin exchanges. And it Bitstamp (supposedly one of the better exchanges) runs into trouble then that would explain the sudden drop in bitcoin prices in the last few days. Oh, is that all you did ? I was under the non-mistaken impression that you used that as some sort of argument against BTC's detractors. So how'd that work out for you? Seems I was a little too specific (see catsmate's post above).